Social Media Demographics – Which Platforms are Right for Your Business? One of the major benefits of marketing your business on social media is getting yourself in front of your target audience. Seems easy enough, right? Not exactly. First, you have to understand who your target audience is, then you need to know where they spend time online. Making an assumption about which social media platforms your audience uses and how they consume information can be risky. It’s not enough to simply throw the dice and hope for a win. Don’t waste your time and money – do your research. Who is your audience? Do you have a multi-segmented audience? Does your audience span multiple age ranges? If so, you may want to consider being active on more than one social media platform. Knowing who is on which social media platforms can help. Who are your customers and what do they buy from you? Look for common themes. Which type of person brings in the most business for you? It’s very possible that other people like them would be interested in learning about your business as well. What is of value to them? We care about where they live and how old they are, but it is also crucial to understand them as humans and what is of interest to them. According to Pew Research Center, Facebook and YouTube dominate the market, with a majority of American adults on each of these sites. Facebook is the obvious choice for most businesses when deciding where they want to market themselves. 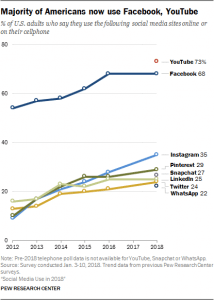 In contrast, as you can see in the graph, Instagram, Pinterest, Snapchat, LinkedIn, Twitter, and WhatsApp are neck and neck in terms of the percentage of American adults on each platform. So how would you know which of these your small business should be on? By digging a little deeper and understanding who your target audience is, you can identify which platforms make the most sense for your business. Facebook is popular among all demographic groups in the U.S. This statistic alone means that Facebook is a very valuable place for your business to be connecting with your target audience. Facebook is by far the largest social media platform, with over 2 billion monthly active users, 61% of whom are Americans between the ages of 25 and 54. According to Statista, 58.3 million U.S. Facebook users are between 25 and 34 years old. Facebook is constantly growing and adapting and will likely be a big part of the landscape for years to come. If you’re ready to join the world of Facebook for Business, check out this easy step-by-step guide to get your business profile set up. Twitter is one of the most well known social networks, with 336 million active monthly users. Twitter has a global audience made up primarily of millennials (36% of Americans aged 18 – 29), and usage drops as age increases. Twitter users are likely to have above average incomes, live in urban areas, and be nearly equally split between male and female. Twitter is a great tool to help small businesses reach and engage with their target audience, but like any other marketing tool, it needs to be used properly and managed well. Twitter users have a pretty high standard when it comes to response time. If you plan to use Twitter to market your small business, also plan to be active on the platform and respond quickly to questions and comments. It’s easy to create your business Twitter account. Just follow these steps. Instagram currently has more than 1 billion active users worldwide with, 76 million users in the U.S. alone! Instagram has been popular with younger generations since its inception. However, new statistics have shown a change – older generations are starting to embrace the app. There are now more people than ever in the 30-65+ age group actively using Instagram. There are also an estimated 71% of U.S. businesses on Instagram, and 80% of active users follow a business on Instagram, making it a very popular place to reach your target audience. Instagram provides small businesses a space to build connections, tell interesting stories, track user data, follow useful hashtags, and drive traffic to your website. Ready to get started? This guide will walk you through the process. LinkedIn is the world’s largest professional network, with 546 million users worldwide and 146 million users in the U.S. LinkedIn is a great place for businesses of all industries and sizes to connect with colleagues, partners, and future employees. LinkedIn’s largest user group is 30- to 49-year-olds, with 27% of U.S. internet users in this age bracket using LinkedIn. The demographics of LinkedIn are much narrower than other platforms, making it a place for businesses who have very specific goals, such as: showcasing your products and/or services, sharing important company information, recruiting new employees, and having real-time measurable analytics to show you what’s working or not. On the flip side, unlike most other platforms, not all LinkedIn features are free. Setting up a LinkedIn Company page is easy. Here’s a resource to help you get started. Snapchat is one of the most popular social platforms among young social media users. A whopping 71% of Snapchat users are under 34 years old, and 70% of users are female. Snapchat is a unique platform, great for innovative marketing campaigns directed at a younger audience. People and brands on Snapchat can send videos and images, called Snaps, to their friends and followers that can be viewed for up to 10 seconds before they disappear. If you have a marketing budget, Snapchat has an impressive ROI on their SnapAds, has many features to choose from (like branded lenses and geofilters), and has strong audience-targeting capabilities. Want to learn more about Snapchat? This blog has all the info! With 200 million monthly users, Pinterest isn’t a massive social media platform like Facebook, but it is holding its own in the social media world. Pinterest is a great place for businesses to market to valuable demographics. For example, 68% of U.S. women between the ages of 25 and 54 use Pinterest, 40% of new users are men, and 80% of millennials say Pinterest helps them find things they want to buy. Another interesting demographic of Pinterest users is that 64% of Pinterest users live in a city or suburb, resulting in a very urban user base. But is Pinterest the right place for your business? Because of the nature of Pinterest, it is often a great source of website traffic, since each pin can be linked to a URL. Pins also have a much longer shelf life than ordinary social posts – one pin can continue to drive traffic to your site for months or years after posting. However, to maintain a strong following and high engagement, you can expect to commit a lot of time to the process. This information will help you get started. 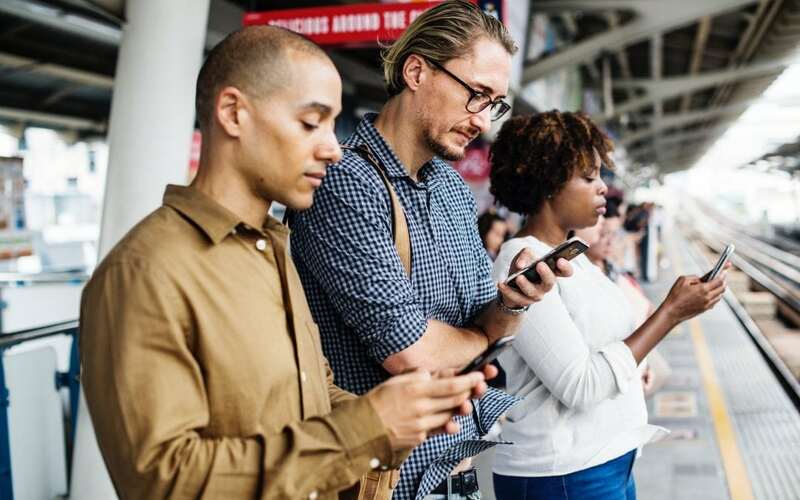 When thinking about your social media marketing, be sure you’re considering who your target audience is and where they spend their time online. If you’re not sure where to start, Aspen Grove Marketing can help! We will determine the key elements of your digital marketing strategy and show you how to meet your target audience where they are – and more importantly, how to best leverage your budget and bandwidth. We’ve worked with businesses of all sizes, nonprofits, and other organizations to develop successful digital marketing strategies to find new customers, increase sales, and ultimately see a return on investment from your digital marketing. We offer everything from full-service management to one-on-one digital marketing consulting. Contact us to learn more!